Of all the gifts I made for Christmas last year, the one I was most pleased with myself for making was shaving cream. I love this shaving cream. 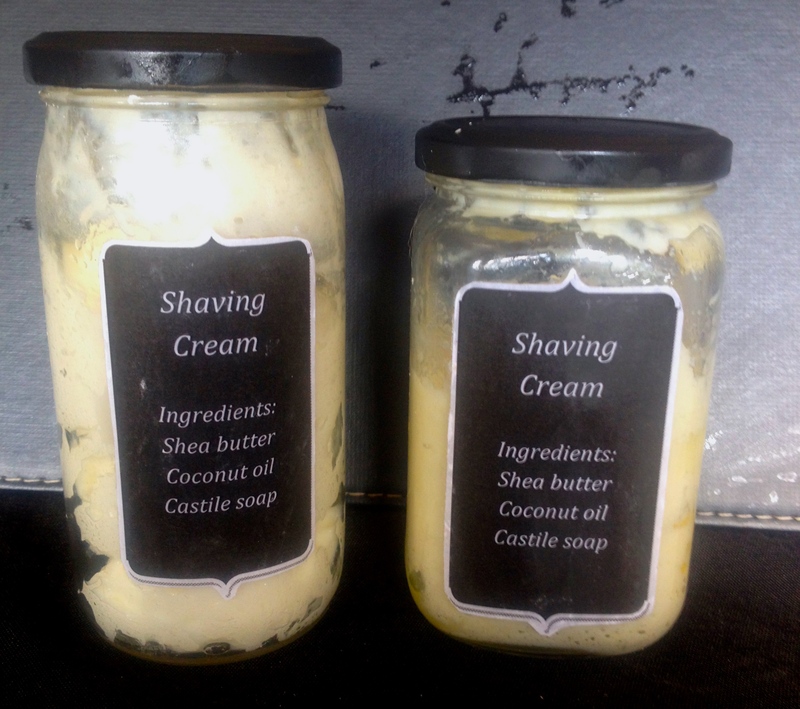 You should definitely start making your own shaving cream. Not only is this shaving cream, a shaving cream, but on account of the moisturising ingredients, it is also a moisturising cream. There are only 3 ingredients, all natural of course, and your involvement time is under 10 minutes. But aside from how easy it is to make this shaving cream, you should also definitely start making it for your skin. Your skin would like you to stop using the ones you have been buying from the shop, on account of the chemicals that are most likely to be in it. I read an article recently from the Mercola website that said in 2004 a study was done on personal-care product use. The study evaluated more than 10,000 body care product ingredients and there were 2,300 participants involved. One of the findings of the study was that the average adult uses nine personal care products each day, and that across these nine products you will find 126 different chemicals. The article also suggests that putting chemicals on your skin and scalp may actually be more dangerous than if you ingesting them. This is because if you eat something, the enzymes in your saliva and stomach work to break it down and flush it out of your system. But when you apply it to your skin, it is absorbed straight into the bloodstream without any filtering, and as I am sure you know, that chemical-carrying blood makes its way into your organs. Your average shop-bought shaving cream is basically made up of water, apparently around 80% (which is pretty disappointing considering the price), and a few other ingredients which are there to make the cream lather, preserve the cream, or (if you are using the type that is in a can) to help it exit the can. Fragrance, which basically means it can have ANYTHING in it. (You can read up on what kinds of lovely things you might find in fragrance in my homemade perfume recipe post). Sodium Lauryl Sulfate (SLS), I am pretty sure you would have heard about this one as it got some serious media attention a while back, and anyone looking to market their product as “natural” will have it labelled “No SLS”. SLS basically makes stuff foam. The Mercola website states that there have been 1600 studies done by the Environmental Working Group (EWG) that demonstrate health risks associated with this ingredient. Triethanolamine, this is what they call a surfactant, which (I think) basically means it helps stuff mix together. Triethanolamine is also used to make cement, and “Reports indicated that TEA causes an increased incidence of tumor growth in the liver in female B6C3F1 mice, but not in male mice or in Fischer 344 rats. A 2004 study concluded “TEA may cause liver tumors in mice via a choline-depletion mode of action and that this effect is likely caused by the inhibition of choline uptake by cells“. Butane, this is one of the ingredients that helps the cream out of the can. You are probably more familiar with butane’s other name, lighter fluid. Propane, another ingredient that helps the cream out of the can, and often found in the same bottle as butane. You are also probably more familiar with propane for one of its other uses, and that is when it is in the gas bottle that is used to light a BBQ. (Here are the lovely ones I made for Christmas, in their upcycled bottles with homemade waterproof labels of course!). Melt the coconut oil and the shea butter together in a saucepan, stirring until completely melted. Add the olive oil and whisk with a fork to combine fully. Transfer to a bowl and put into the fridge to set completely. Once set, using an electric beater, whip the cream, adding the castile soap. You really want to whip it…. whip it good. But don’t go throwing away your shop-bought shaving cream, use it to make some art. The Realistic Mama has 10 ideas for using your shaving cream to make art. Categories: Personal Care, Recipes | Tags: homemade shaving cream, homemade shaving cream recipe, shaving cream | Permalink. Does this shaving cream stay fluffy? I couldn’t get any shea butter when I was making my shaving cream so I improvised with cacao butter. It whipped up beautifully but melted after being left on the bench for 3-4 warm days. It still works a treat but leaves a bit more of a residue than I guess the shea butter would, but that just means I don’t have to moisturise :).